1 drop of boiling water. Delay the mix in some 9 cupcake cases. Bake the muffins for 40 min approx in a preheated oven at 180°C/360°F. When cooked, allow the cupcakes to cool on wire racks. In the icing sugar delay the drop of boiling water and stir. 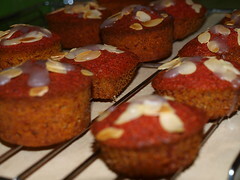 Ice the cupcakes and spread almonds slices. Comment: an improvement would be to roast the almonds before spreading on the sugar. But I forgot. Next time!